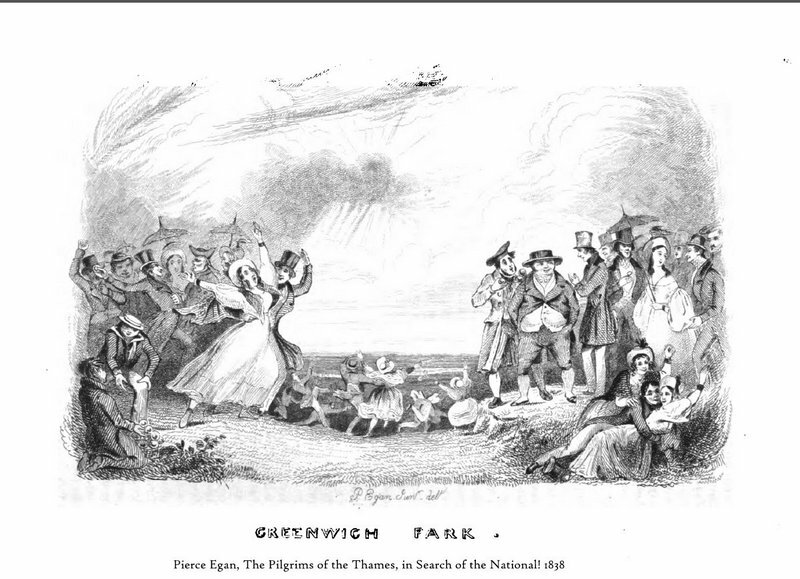 Dickens's lively account of Greenwich Fair. 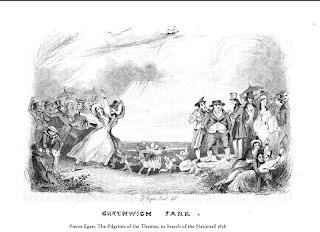 If the Parks be "the lungs of London," we wonder what Greenwich Fair is—a periodical breaking out, we suppose, a sort of spring-rash: a three days' fever, which cools the blood for six months afterwards, and at the expiration of which London is restored to its old habits of plodding industry, as suddenly and completely as if nothing had ever happened to disturb them. 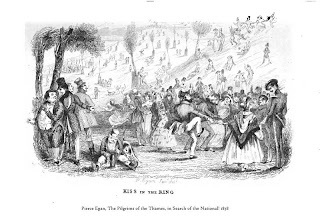 The chief place of resort in the daytime, after the public-houses, is the park, in which the principal amusement is to drag young ladies up the steep hill which leads to the Observatory, and then drag them down again, at the very top of their speed, greatly to the derangement of their curls and bonnet-caps, and much to the edification of lookers-on from below. "Kiss in the Ring," and "Threading my Grandmother's Needle," too, are sports which receive their full share of patronage. 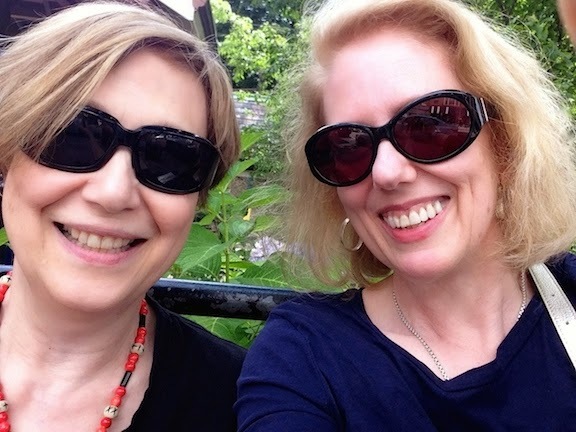 Love-sick swains, under the influence of gin-and-water, and the tender passion, become violently affectionate: and the fair objects of their regard enhance the value of stolen kisses, by a vast deal of struggling, and holding down of heads, and cries of "Oh! Ha' done, then, George—Oh, do tickle him for me, Mary—Well, I never!" and similar Lucretian ejaculations. Little old men and women, with a small basket under one arm, and a wine-glass, without a foot, in the other hand, tender "a drop o' the right sort" to the different groups; and young ladies, who are persuaded to indulge in a drop of the aforesaid right sort, display a pleasing degree of reluctance to taste it, and cough afterwards with great propriety. You can read the entire funny and vivid account here at Google Books or here at Internet Archive. There's more about it here. And James Grant wrote his own account in his Sketches in London, 1838 (with illustrations by Phiz, or Hablot Knight Browne, who also illustrated for Dickens. More about the fair here. Illustrations from Pierce Egan's The Pilgrims of the Thames, in Search of the National! 1838.